A customer recently came to us with an idea for one of the most unusual uses of a curtain track that we have ever heard of, and we’ve heard a lot of them. She recently began working as a voice-over artist and was creating a home audio studio. She had a small, sound absorbing alcove that she needed to close off in order to create an audio studio quiet enough to set up a very sensitive microphone. She described her space and needs to our customer service rep, who knew just what she needed. Our rep first recommended that our customer use our 6100 Flexible Curtain Track, because she could bend it as needed around the alcove opening, which allowed her to also line the curtains along the walls, creating an even tighter sound space. She planned to use moving blankets as curtains (they were recommended by a sound technician), but wasn’t sure how she would hang them. Our rep instructed her in how to make grommets with a grommet kit from a local craft store, which our customer assures us was quite quick and easy. Given that moving blankets are thick and heavy, our rep suggested she use the heavy-duty flexible curtain track. Luckily for this customer, her space is in a basement with a drop ceiling, so installation was quite easy with the use of drop ceiling clamps. So with her moving blanket “curtains” made, and the track installed, she hung the curtains with the proper carriers and hooks. 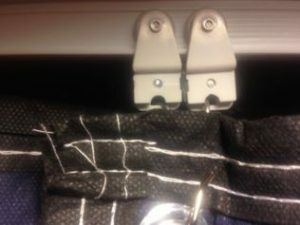 Lastly, she wanted to make sure that when the curtains were closed, they would stay that way, so the lead carrier on each panel is a magnetic catch carrier that holds the curtains together with just a bit of overlap, closing off the space and making it very quiet. 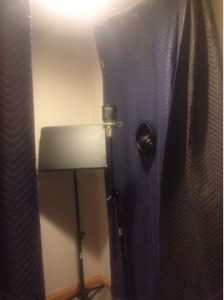 Her audio studio complete, she is ready to record! You may not be stepping up to a microphone in your own audio studio, but we bet our customer service reps can help you figure out how curtain tracks can make your next home project easier. Call them today at 888-434-7444.